Peterborough Panthers will be without Bradley Wilson-Dean when they complete their SGB Championship campaign tonight (October 13). The New Zealand champion misses Panthers’ home clash against Edinburgh due to sickness. 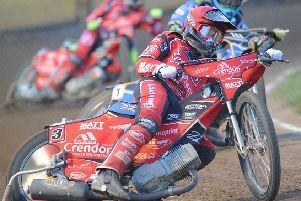 Panthers are chasing a seventh successive league victory as they bid to climb into fifth place in the standings. They will operate the rider replacement facility for Wilson-Dean and also use a guest at reserve where Jack Parkinson-Blackburn steps in for Tom Bacon. Parkinson-Blackburn is also set to replace Bacon for the KO Cup semi-final first leg against Glasgow on Sunday (October 15). Bacon is set to have shoulder surgery on Monday.